"With verve, wisdom and honesty, Jocelyn explores the realities of human curiosity, friendship and life with a physical trait that will always have to be accomodated." In the late nineteenth century, in a little dot of a town called Westley lives the smallest girl in the world. Josephine stands only twenty-two inches high, and her parents charge gawkers a penny apiece to see her - until they realize that the headmistress of MacLaren Academy for Girls will pay even more. After five years at the Academy, where Josephine is treated little better than a slave and must endure the mockery of the fine young ladies, her heart cries out for freedom. One day she takes five gold dollars and runs away. When she stumbles upon R. J. Walters, proprieter of the most renowned curiosity show in Coney Island, she gets a new name - Little Jo-Jo of Bavaria. She also gets some new dresses and even an elegantly saddled golden retriever to ride in her act. But Jo's spreading fame draws an enemy from her past ever closer - until all she has begun to cherish in her newfound life is in jeopardy. This compelling novel from Marthe Jocelyn introduces a marvelously believable heroine from a time and place filled with many wonders. 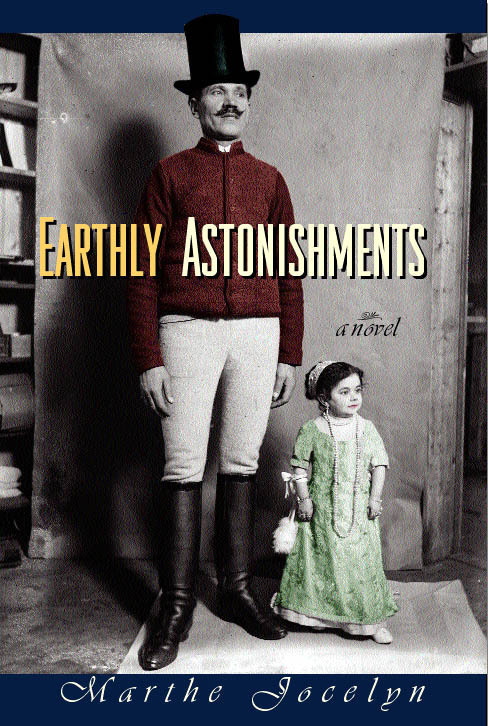 About Earthly Astonishments, the author says, "Mr. P.T. Barnum and his most famous midget exhibits, General Tom Thumb and Lavinia Bump Warren, are the only real people in this book. The Museum of Earthly Astonishments did not exist, but there were dozens of real 'dime museums' in the New York area during the second half of the nineteenth century. The curators of these exhibits displyed all the curiosities mentioned in the story, as well as many more - human and otherwise. Mr. Walters and the other characters helped me to tell a story about a time and place in history that has always fascinated me. And although many of Josephine's troubles are a result of her small size, her solutions come from quick wits and courage, qualities available to all of us today."